Sallie Bilbo Muse passed away Thursday, September 13, 2018 at the age of 83 years old. She was born in Villa Rica, January 29, 1935, daughter of the late A. B. Bilbo, Jr. and Bernie Helton Bilbo. Sallie was a member of Center Point United Methodist Church. In addition to her parents, she was preceded in death by a daughter, Julie Muse; a sister, Katherine Stansel and two brothers, Hoyt Bilbo and Earnest Bilbo. 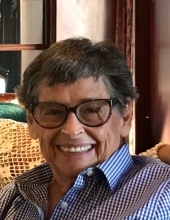 Survivors include her husband of 66 years, Julian W. Muse; two daughters, Jamie Muse, Jill and Randy Cook; three grandsons, Julian Stroupe, Ethan Cook and Davis Cook and a number of beloved nieces and nephews. The family will receive friends at the funeral home Saturday, September 22 from 11:00 AM until 1:00 PM. A Celebration of Her Life will be Saturday, September 22 at 1:00 PM from the chapel of Hightower Funeral Home with Reverend Bill Tidwell officiating. In lieu of flowers, please make donations to the Center Point United Methodist Church Cemetery Fund, Center Point United Methodist Church or to the National Kidney Fund. To plant a tree in memory of Sallie Bilbo Muse, please visit our Tribute Store. "Email Address" would like to share the life celebration of Sallie Bilbo Muse. Click on the "link" to go to share a favorite memory or leave a condolence message for the family.